I don’t know about you, but my kids LOVE magnets. They are constantly rearranging the magnets on the fridge and fighting over who gets to play with which magnet. 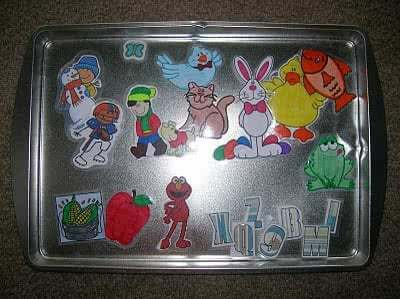 One day when I was at Dollar Tree, I saw that they had mini cookie sheet pans and I started thinking about how that little pan could totally fit in my “Church Bag” (a.k.a. the bag filled with random toys that will keep my kids quiet so that we don’t disrupt people around us at church). Then I started thinking about how I could stick magnets to it . . . and the rest is history. I bought the pan and came home and started finding random clipart online . . . it was springtime when I made it, so I had Easter clipart with bunnies and eggs and then I started thinking about how I could use this as a learning tool so I printed off the entire alphabet and numbers, fruits and veggies, etc, etc. I printed them out, cut them out, laminated them, then purchased a roll of magnet strip and stuck a magnet on each little picture. It has been awesome. It keeps the kids entertained for at least 10-15 minutes, which is huge at church- that is like one whole speaker and a prayer! Ha ha! 🙂 We have also taken this to the Dr.’s office and other places where they need to sit quietly. I know it’s random, but it works. I also add new little magnets every once in a while, to keep it fresh. Right now Bryn is really into princesses and Mason is into Toy Story 3, so I found tons of images online to use on their boards. I make sure to have a magnadoodle, and church memory games. This is great! I am thinking about printing the clip art on magnetic paper!